Wife Lila decided to go with me when I spoke at a telecom conference in Las Vegas at the end of October. 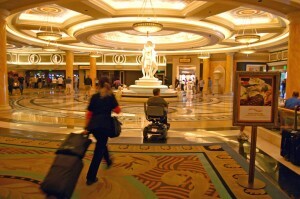 We learned how much walking there is to do even inside one casino when Kid Adam got married there in 2005. Lila did battle with a weed root in yard several months ago and the weed won. (I believe in letting foliage take its natural course, so that would never happen to me.) Since then, she’s had difficulties walking long distances on hard surfaces. 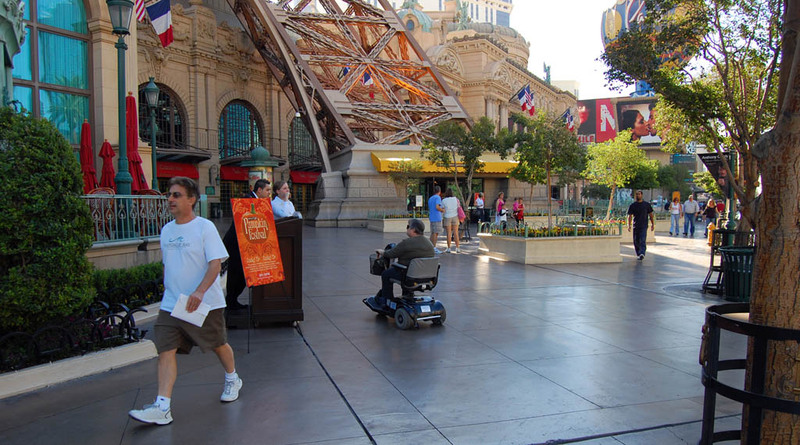 As soon as we checked into Caesars Palace, we headed for the bell captain to see if motorized scooters were available for rent. They cost $40 a day or $105 for the three days we were going to be there. Except for that elevator incident…. Trust me it WASN’T closing. At least not until Lila got off the scooter, and I lifted the rear end so it would clear. Somewhere in Security Land, that video must be on the Greatest Hits List. Most folks (at least the smart ones) gave her plenty of clearance. She did learn that most tourists are busy looking at the distance from standing eyelevel and aren’t aware of someone much lower at seated height. I told her it was a shame that I didn’t have my bike with me so she could borrow my Delta Airzound Bike Horn and flashing strobe light. 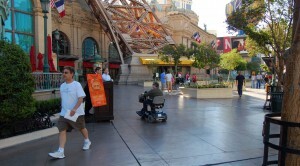 Folks on two good legs wonder what’s the big deal with the Americans with Disabilities Act (ADA). 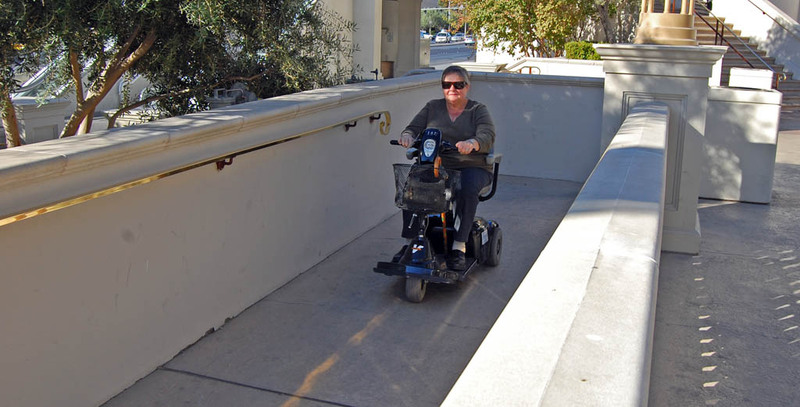 When you have to figure out how to find ramps, elevators, automatic doors (or nice folks who will open them for you), then you gain a new appreciation for the challenges faced by wheelchair users. Even when you can find an automatic door opener, the button’s not always in a convenient place. When you go through an automatic revolving door, the rotation slows down, at least until some impatient person gets on behind you and starts pushing it manually. Overall, most people were helpful. The first evening at Caesar’s Palace, we took off trying to find a reasonable place to eat. We had a map of the joint, but I do a lot better when I can see the sun or use my GPS. Unfortunately, the map didn’t show where the ramps were located. Some of them were obvious, but some of them were hidden. After a while, though, we got better at breaking the code. By the second day, when I was stuck at the seminar, she gathered up enough courage to head out on the strip to explore on her own and stayed out until the battery was getting low. Overall the $105 was a good investment. She got to see a lot more than she would have hobbling along with a cane. It was a good exposure to the options that are available if you are temporarily or permanently disabled. It sure opened my eyes to the barriers to mobility that I had never considered before. 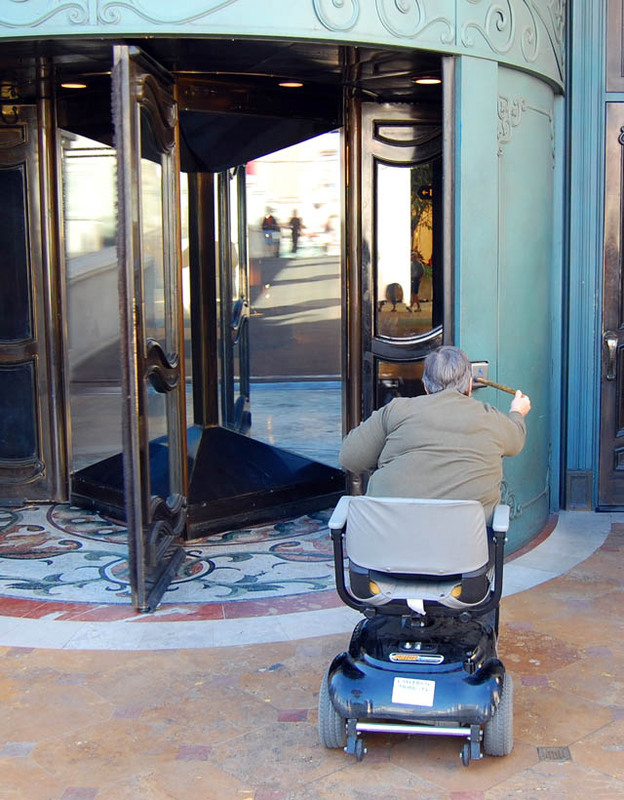 An explanation is in order concerning the picture of me using my cane to push the “big button” that slows a revolving door so handicapped users can get through. Using a cane to push buttons is not something I would recommend, because of all the yucky stuff that it touches. However, the revolving door presented its own unique problem. The doors revolve counter-clockwise, and the button to slow it is on the right of the entrance. The natural motion would be to push the button and drive in to the left, but that would work only if the door were traveling clockwise. 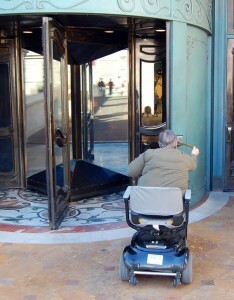 Once the button is pushed from the scooter, one must back up and re-aim the scooter to enter the revolving door before it speeds up again. I couldn’t get myself backed up and realigned before the door sped up or impatient people began pushing it… not to mention, trying to avoid hitting the people who were on a mission to beat the scooter through the door. 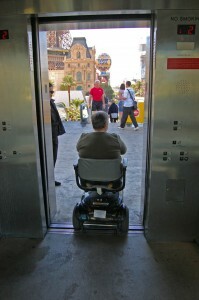 The only way I could manage a revolving door, without another person to push the button, was to park the scooter back far enough to the left of the button to be able to make a direct run through the door, and then use my cane as an extension of my arm to get the button. 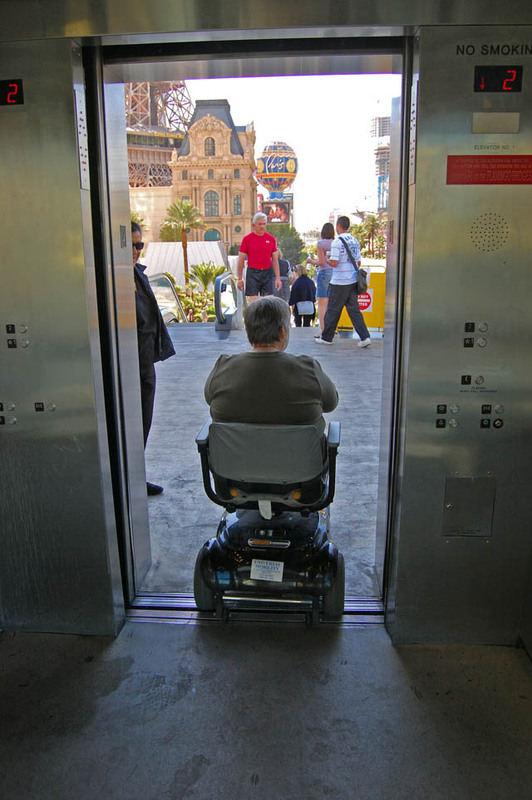 While I have a passing familiarity with the Americans with Disabilities Act, I am not sure how or if it addresses the issue of revolving doors. It must require that buttons, that automatically open doors for people with disabilities, be on the right for conformity. 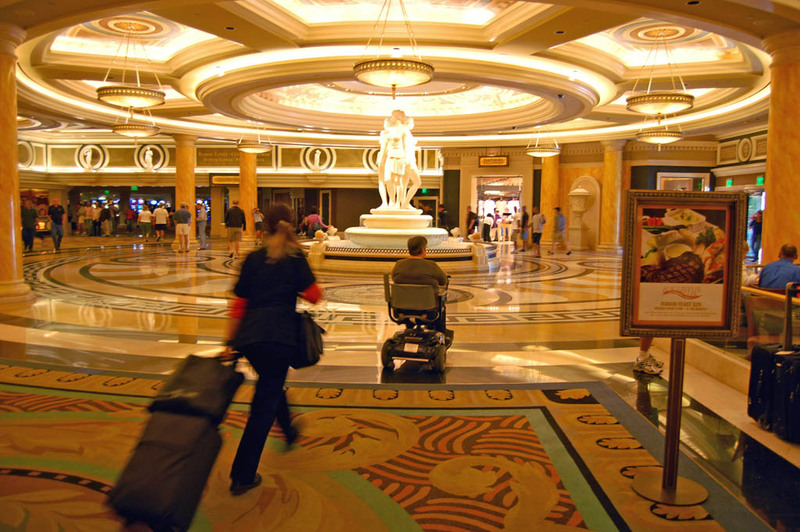 While this is generally a good idea, the reality is that, if there is a counter-clockwise revolving door, the button to slow would work better on the left to allow wheelchairs and scooters to enter the door headed in the right direction. Either that, or have the door revolve clockwise. Of course, this was my first attempt to move among herds of people while using a scooter. Maybe someone with more experience can suggest a better way to maneuver through a revolving door. I just looked at scooters. For the price of a nice bike, I could get an electric scooter. Unfortunately, while the bike will run forever on a cheeseburger and fries, the scooters are limited to about 25 miles at five to six miles an hour. I’m gonna keep my bike for now. Next PostNext What’s Going to Happen on Wednesday?